Tregaron01970 612125work TownTregaron nestles in the foothills of the Cambrian Mountains near the source of the river Teifi. In the 19th Century, it was a thriving market town and an important stop for drovers on their routes through Wales driving cattle, horses, pigs, geese and sheep to English markets. The town's traditional market, "Ffair Garon" was granted its Royal Charter in 1292 and is still held today. Cors Caron Nature Reserve boasts over 170 species of birds - some local, others migratory visitors from far flung regions of the world. However, one of the most spectacular sights in the region is the red kite in flight. As a species it was saved from near extinction in the UK and the Tregaron area was one of the first areas to settle re-introduced red kites, and thankfully they have continued to thrive. The Red Kite Centre and local history museum on the outskirts of the town provides information about the kite as well as other local wildlife. The Talbot Hotel which commands the town centre has a wealth of history dating back to the 13th Century. Twm Sion Cati is a figure in Welsh folk-lore often described as the Welsh Robin Hood. The hills and valleys around Tregaron were once the playing fields of Twm, highwayman, thief and prankster, whose exploits were legendary throughout South Wales. A handsome man of many faces, he could swap between the fine robes of a gentleman and the rags of a peasant to suit his mischievous deeds. 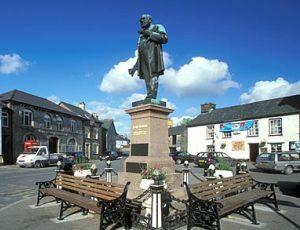 On Tregaron's main square stands a statue commemorating its most famous son and his will is displayed in the towns' museum. Also, there is a town trail named after 'Twm' that takes you to locations directly linked to him. The drover's road to Abergwesyn begins at the Talbot Hotel. Before setting off on their long journeys, Drovers would prepare their livestock in a number of ways which might seem strange to us today. Black cattle were shod with iron plates, pigs were fitted with woollen 'socks' with leather soles, and geese's feet were coated with tar and sand to protect their feet. Historically, one of the important industries for this area was wool and woollen products. The Doldre part of the town was renowned for its knitting, and these products were sold locally as well as taken to markets to the southern mining communities of Wales. Wool from the area was even used as a base for the railway line that once crossed the reddish bog to the north of Tregaron, known as "Cors Caron". Tregaron nestles in the foothills of the Cambrian Mountains near the source of the river Teifi. In the 19th Century, it was a thriving market town and an important stop for drovers on their routes through Wales driving cattle, horses, pigs, geese and sheep to English markets. The town's traditional market, "Ffair Garon" was granted its Royal Charter in 1292 and is still held today.